We're not Rick's Cycle, Rickscycle or Rickcycle. We are the one and only RickSycle. Everything you need to pedal with four people. The Falco EBike Kit, when installed on your Ricksycle, allows you to ride longer distances and defy hills and wind. It becomes your disabled riders power. 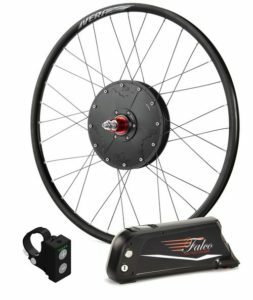 For more information about the Falco EBike Kit please contact us. For Riders who are shorter than 4'11" (150 cm). Made only to attach on the right side. Allow yourself to take a long ride without worrying about whether or not your child can make it. With very little effort you can carry your child on the Ricksycle and allow them to pedal at their own ability. the side by side seating makes it easy to interact with your child and gives them a good view of the scenery ahead. The Carrier is approximately 20 inches by 60 inches (51 cm x 152 cm). You can easily attach it to the rear of the Ricksycle without the use of tools. Carry camping gear, groceries, a wheelchair or even use it to transport your Ricksycle on the hitch of your vehicle. Keep your passenger strapped in safely on the Ricksycle with a four point harness. The three buckles make it easy and quick for you to secure your rider. The harness is adjustable to fit mots people. For added support and security please see the seat designed for the disabled rider. When the straps are installed on the pedals of your Ricksycle you are guaranteed that your feet will be kept securely in place. They feature 3 quick release buckles each and are adjustable to any foot size. Clips on to any Ricksycle in minutes to allow anyone to ride. Straps are provided to keep the rider in. One for legs, one for the waist and one at chest height. this seat is usually custom built to suit the rider. Comfort level is very high. Custom Seat for disabled riders are available and priced on an individual basis. Another option are foot rests for the person who is unable to move their legs in a pedaling motion. they can be adjusted to fit most riders and there are foot straps available. The Ricksycle foot rests can easily be added or removed without tools. The Ricksycle is a component based cycle, therefore any component can be purchased seperate. This allows you to add to your current cycle or build a unique cycle based on your needs and desires.